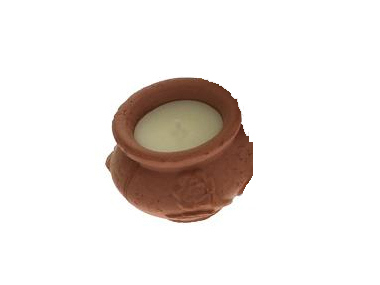 Order Dalit Mini Rose Candles in Pot from the Online Health Food Store UK. Buy Dalit Mini Hand Crafted Rose Candles in wee Pot and other quality Gifts safely online in the UK. Hand crafted miniature candles which are scented with lavender and a hint of vanilla in blended beeswax. If you want to automatically receive an email when 'Mini Rose Candles in Pot' is back in stock, just leave your email address below. A beautifully designed fair trade candle, made by a master potter of the Dalit people for the Artisan Collection by Dalit Candles. The Sonu candle features a simple and elegant wave line design and has a delightful lavender scent with a hint of vanilla. Purchase of this candle goes towards helping the Dalit people, an oppressed group in India who are rarely given opportunities to climb out of economical hardships.An ethical and environmentally friendly alternative to the tea light candle with a smooth finish. A hand crafted miniature rose candle which is scented with lavender and a hint of vanilla in blended beeswax. Our UK Health Shop sells real Dalit and other Gifts from top-quality brands safely online to customers throughout the United Kingdom in England, Wales, Scotland and Northern-Ireland. View more products on the Online Health Food Store from Dalit. Where to buy Dalit Mini Rose Candles in Pot safely online? Shop at the Online Health Food Store if you are wondering where you can buy Dalit Mini Hand Crafted Rose Candles in wee Pot safely online in the United Kingdom. Mini Rose Candles in Pot - Dalit Mini Hand Crafted Rose Candles in wee Pot in Gifts and Easter & Gifts.